Yay - a new book! Many quillers rely on books for fresh ideas and it's been far too long between titles. Perhaps you're familiar with Thrilling Quilling, The Papercrafter's Bible, Cards For Men and Boys, or Quick and Clever Christmas Cards... all of these are books by expert paper crafter, Elizabeth Moad. Christmas Quilling is Elizabeth's brand new, self-published book that features twenty step-by-step quilled projects and sixty card designs. There's no need to be concerned about the self-published aspect, as there is nothing amateur about the book's presentation and content. I've been reading Elizabeth Moad's blog for quite some time and have been impressed by her books, so was excited when she offered to send me a copy. Elizabeth has included all of the information a beginner will need, from supplies to shape making, in addition to some neat, new techniques, even for those with plenty of experience. For example, wait until you see her realistic fir branches! The project ideas run the gamut from cute to classy. If fact, if I had to find something to quibble about, it's that the cover doesn't quite convey the modern ideas you'll find inside, many of which are novel and elegant. I love this topiary with gilded pears. Elizabeth will be sending an autographed copy to three lucky commenters who live in the U.S., Canada, or the UK. To enter, just leave a comment by the end of Monday, September 13th telling why you would like to win. Earn up to three extra entries by mentioning the giveaway on Twitter, Facebook, and/or your blog. Winners will be selected by a random number generator. The reasonably priced book is available in the UK via Amazon UK and Amazon in the U.S. Next week I'll be posting an interview with Elizabeth that I think you'll enjoy. Oh I would love this book. I'm a huge fan of paper crafts and having a book about a paper craft would just be the best. I love to make and send quilled cards and this book would be great to add to my library. Getting inspiration from a great quiller is always fun. I love to read your blog. I enjoy all the different paper art you share, but I found you when I and my 12 year old were learning to quill. Thus, to win this book would be a treat for both of us. Thanks! I think it must be a great book seeing how good her work is. Oh Ann, you have made my day! I didn't know that Elizabeth had a blog, let alone that she actually lives here in the UK and runs workshops! I shall be following closely from now on. 'Thrilling Quilling' is one of my favourite sources of inspiration, and her Christmas book would definitely be the icing on the cake for me! I would love to win this for my Grandma and I. We could always use more resources for inspiration when it comes to quilling. 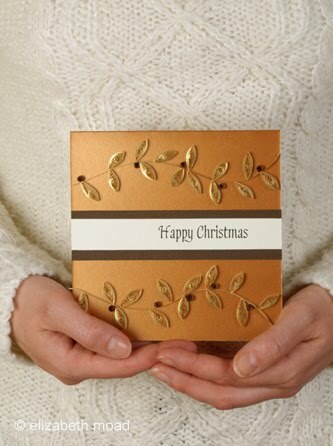 I've just started thinking about Christmas cards over the weekend and this would be brilliant for ideas. I would absolutely love a book! I'm newer to quilling and I really enjoy it! But I struggle with inspiration...so this book would be perfect! I just put her blog in my google reader - so that'll help! Thanks for sharing this great book - I'll keep an eye out in the states! Wow!! What a wonderful looking book, I would absolutely love to have a copy. I'm a newbie at quilling, and am just having so much fun learning from others, and I certainly would like to learn Elizabeth's techniques. i would love to win this book! i own thrilling quilling and it's a great book! i love quilling and christmas so what could be better than this book! As always I look forwarding to seeing her new book. I love adding to my library of books but it's been tight with the progression of my disability. Hopefully if I don't win the book it will be added to our library shelves. Thanks for the update. How awesome this would be. I get my inspiration for books, don't always follow exactly. What could be better than a signed book by Elizabeth Moad? Quill with her in person... Yes!! Thanks! After sitting on the sidelines, I would love some help getting started with quilling! we've just moved across the country, and quilling is my way of keeping sane! thank you for such a *wonderful* giveaway! I've been hearing such good things about the book thrilling quilling and have been wanting to get it. Now a new one for christmas designs. As much as I've enjoyed what I've been making so far, I really would like more designs to work with and hopefully get a little better in the process. This would be a great quilling inspiration book to own. And learning new techniques is always a plus. That pear tree is amazing! I am brand new to quilling and would love to have this book as inspiration! Thanks for letting me know about her blog! Quilling is so impressive. This book looks like it has great ideas! I would love this book to make these projects in time for the holidays for my family and friends. She is my HERO....that is the only reason. I would be thrilled to have an autographed copy. Thanks for offering this giveaway, Ann. It is a great pleasure to have a book on quilling from Elizabeth Moad- one it adds more thrilling for my quilling to use as an inspiration and especially if it comes from my favorite blogger. There will be always a "wow" factor in your blogs. Such a beautiful book!!! My fave is the pear tree! Stunning!!! I have a bin full of quilling supplies, but have yet to jump right in and get started. I'd love to win a copy of the book! It would be nice to include some special quilled cards in my Christmas assortment this year, or even some quilled gift tags. This book looks great, and it would help me combine my regular paper crafts with some holiday quilling. I'm new to quilling and have been searching for books to learn from. There really isn't enough of them out there. This book sounds really neat. It will be interesting to hear your interview! Thanks! what cute ideas! this would be a great introduction to the world of quilling. what a fantastic giveaway, thanks so much! I have a direct link to your blog from mine and check in to see your lovely work when I can...glad I stopped in today.. I am a self taught Quiller. So would love to have some book for inspiration and to see, if I am doing it the correct way. Thanks for a chance to win. A new source of inspiration is always welcome, more so if it is Christmas related. Thanks for the opportunity. Bummer, I just got the update Tuesday morning! Would have loved to win this. I just started following your blog recently and am new to the quilling world. Love your work. I would love to win because I wanna see that fir branch! Always looking for new quilling ideas and this book looks great!! Thanks for the chance!! I love papercrafting. Seeing your beautiful work makes me want to learn how to quill. My big sister taught me how to quill, (and it still teaching.) I would love to present this book to her as a "just cause" gift to let her know how much I love and appreciate all her help. Oh, I would love to have this book! What a great birthday present to myself it would be, since my birthday is the 12th of Sept.! And I don't have this one! Love it!! PLease enter me in the drawing!! I am retired and on the road with my husband because of his job. I would really love to have something interesting and creative to spend time doing. This sounds like just the thing that I could also take with me wherever we go! LOVE that pear tree! Some people are so amazingly creative and talented! This is one of the best paper craft books I've ever seen! I'd love to win it! I love quilling. I think it is the most beautiful form of paper crafting. I have added your link to my side bar on my blog. i am carrying on the quilling tradition for our family. my husband's aunt had done quilling for many years but recently passed away. she has shared some of her work with me over the years! this new books would be awesome to own! This would be an awesome addition to my collection! I just started quilling in January 2010, so this is my first Christmas for quilling. I am so excited to get started! Beautiful designs! I'm a paper-crafter hobbyist and love books like this for inspiration. Thanks for having this contest! I just started quilling last year and would love to win this book!!! Christmas is my favorite holiday! I would love to win this book! I love to make cards to send for Christmas or with gifts and I love new ideas and to learn new techniques. This book would be a joy to have as I haven't tried quilling yet. I actually have it on pre-order from Amazon for the NAQG Archives! Looking forward to receiving the book. I love Thrilling Quilling - it reignited my love of quilling so would love to get this book. I have been waiting for this book to become available on Amazon - if I'm lucky, maybe I won't have to wait too much longer! Elizabeth's work is great - I am a big fan. Ann, thank you for this post and for keeping us all up to date on the latest paper art items. I, too, have been waiting for another book to appear! Would love to win this great book because I am always looking for new quilling ideas and this one looks Awesome, thanks for the chance to win. Thanks for the chance to win! I'd love to have a copy of this so I can keep trying to learn more about quilling. I would love to win because I have been toying with the idea of picking up quilling and something so great will get me right into it. I love papercrafting and I would love to learn how to quill. I have always been intrigued by quilling. What's not to love about that pear tree. This book would be a tremendous asset in helping me raise awareness for the art of quilling paper. This city is rich with art and people who love art, but no one has yet to take paper quilling seriously. Even our craft stores have done away with quilling material and tools! I would love to complete as many projects from this book as possible and donate them to craft stores locally so our papercrafting-deprived city could see the beauty and forgotten wonder of paper quilling here in Roanoke, VA. This is a fantastic opportunity! Oooh! What beautiful work! As a new quiller, i am still facinated by everything. I haven't done much for Christmas and would love to learn. I love quilling and it sounds like this new book is right up my alley. I started quilling about a year ago and I find it fascinating. I love to see the beautiful things that people make and I love to learn new techniques. I love anything to do with quilling and would Love to win this book! The topiary photo is incentive enough! Please stop by my GiveAway Bonanza and add this link! I am new to quilling and would love a copy of this book for the great ideas.Thank you for the opportunity to win a copy.Great designs. Perfect timing need to start on the Christmas cards soon or no one will get one. I have just learned to quill and I love your pics! Ann this was awesome,I so wish I'd thought of it first. I've fallen in love with quilling in the last couple of months and you've be a big part of that. Thanks! I want to thank you for all the wonderful ideas that you post for us to see just what is possible with paper. You are an inspiration with your work too, thanks for the chance to win the book on Christmas quilling. I just might give it a shot. Thank you for this post. Sandy is right - quilling is a great stress reliever. I'd love to do some of the projects in her book. That book sounds wonderful! I quill from time to time, and am participating in a Christmas Card swap this year and wanted to quill for it - this book would be the perfect inspiration! Thanks for the opportunity to win! I can remember doing quilling in school, but I have not done it in years. What a fabulous book! I am beginning to see the possibilities are endless! Christmas is my favourite time of year to quill for. Elizabeth's other books have given me lots of inspiration and I am always looking out for new ideas so this book would be a brilliant addition to my bookshelf. 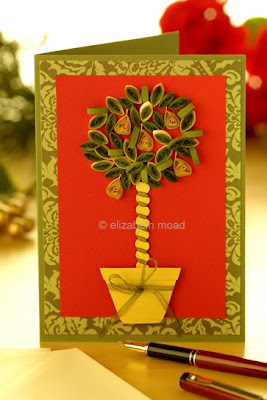 I would enjoy making some of these cards and my oldest daughter would love to join in the fun! Oh, pick me!!! Pick me!!! Quilling is so beautiful and this book looks to have such wonderful ideas! Did I mention "pick me"??? Good evening from Missouri USA, we found your website from the Design Sponge site and I was delighted to see that you have embellished wedding stationary using Quilling. I discovered this skill about 5 months ago (in Ireland where I spend half the year) and have entertained myself for hours with it in Missouri. My fiance & I really like the effect of it but never thought to incorporate it into our wedding invites, hence we would really like to win your book - to basically plunder some of your ideas if you don't think it is too much of a cheek!! I've been in denial for weeks, putting off starting all the quilling I want to do for Christmas. Winning this beautiful book would be a fabulous way to snap me out of it. And then I could spend three months making lovely pear trees. Ann your blog is wonderful. It is so well written. (Do you have some secret past life that involved writing?) And the treasures you find for us are amazing! Thank you. Thanks so much for entering, everyone! The winners have been announced. Maggie and Michael, best wishes on your wedding and if you have any quilling questions, you know where to find me. Kathleen, thanks so much. I was a hospital med/surg nurse in my previous life, but enjoy writing quite a lot.